This design is from Embroidery.com and, as of today, 12 Feb 2015, is still free. 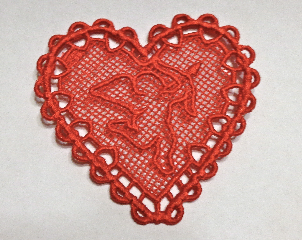 I chose the red thread because it really says, "Happy Valentine's Day" and besides, I'm tired of white - white snow, white snowflakes, white frost, white icicles, and white salt on the roads... LOL! Thanks for looking. So cute! I'd downloaded it a few weeks ago from Starbird (Embroidery.com carries them and a bunch of others - both of their heart freebies are Starbird's). Thank you, Arlene. Happy Valentine's Day! Really like your cupid heart. Your heart is beautiful! Thank you for the link. That's a beautiful heart, love it. link too. Happy Valentine as well! Thank you, perfect for the day. You're quite welcome and glad you've joined us! Thanks for the link. Your stitch out is beautiful, I like the red. It it beautiful in red. Red is for Valentines! Thanks, Toogie. I like the red, too. Very nice. I love fsl !!! Thanks, Kathy and WELCOME TO CUTE!